GOLD BALLS is an uplifting story about five competitors who barnstorm the country in pursuit of a National Championship title in tennis. Shot at National Championship locations around the country, GOLD BALLS explores universal questions about aging, mindset, and the unexpected power of a goal. As we explore what makes a champion, we're there for lonesome and glorious moments as these seasoned players attempt to achieve final goals on their bucket lists. On this cross-country odyssey, obstacles include travel challenges, aging body parts and the ultimate opponent: mortality. When they must face their toughest obstacles yet, these athletes are forced to dig even deeper to make their dreams of championship a reality. It's a story about the ageless human spirit and an inspiring must-see for people of every age and stage. As we explore what makes a champion, we're there for lonesome and glorious moments as these seasoned players attempt to achieve final goals on their bucket lists. On this cross-country odyssey, obstacles include travel challenges, aging body parts and the ultimate opponent: mortality. When they must face their toughest obstacles yet, these athletes are forced to dig even deeper to make their dreams of championship a reality. I still remember the night I first had the idea to do a film about ultra senior tennis. Within moments I knew I was onto something. The topic was a deep dive into a little known subculture, it promised travel to beautiful locations, opportunities to meet compelling characters, plenty of action, and held the potential for a built-in competition structure. A month later, I hopped on a flight for Sarasota, Florida on a speculative trip to scout for GOLD BALLS. I believe we all have a need for honest, sensitive and hopeful stories about characters to whom we can relate but can also learn from. 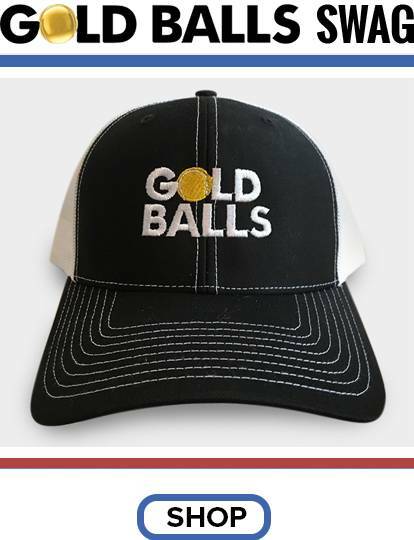 The cast of characters in GOLD BALLS reflects a range of masculine archetypes that will be familiar to just about everyone — the All-American coach, the gritty underdog, the cocksure comedian, and the insecure first-timer. What unites these characters is their common need for wins, or at the very least, a competitive fix. And the fact that despite (or perhaps because of) advancing age, they remain stubbornly motivated to keep competing. GOLD BALLS has a sweet and humorous tone, but the ever-present sense of fleeting time gives the film a deeper thematic mooring and broader message. On a basic level, the story of these aging athletes offers perspective on themes that always intrigue me: what distinguishes champions, and the psychological legacy left by our parents. To me, there is nothing more enviable than the certainty and conviction professed by people like Ron and John and Bob. Whether or not they are even aware of it, they challenge the rest of us to align our objectives and get busy doing what we want to do, while we still can. 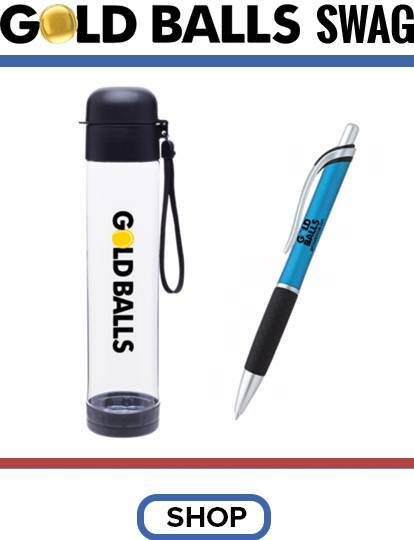 From first inception to print, GOLD BALLS took about three years. It was uncertain and often exhausting work, but I believe my team curated a sensitive and worthy portrait of these champions. As a director and producer, the challenge throughout every step of this process has been to reconcile my ambitious vision with reality. But documentary is not perfect — it is real. And it is the reality of the characters, their goals, drive, ambition, challenges and life that has inspired me. I hope that our audience finds that same inspiration in GOLD BALLS. Kate Keckler Dandel is the founder of 80-Love Movie LLC and Scout Hill Productions, a Seattle-based production company dedicated to productions that entertain and enlighten. I'm Kate Dandel, the Director and Producer of GOLD BALLS. I grew up near Kalamazoo, Michigan, though I've lived in Seattle, Washington for the past 18 years, with a two year hiatus in Los Angeles somewhere in there. I have worked in marketing, consulting, and public policy and I believe that film is the most powerful medium we have today to engage in social and cultural critique and change. It's a very exciting time to be a part of the media landscape, there's amazing content and new forms and delivery systems are being developed every day. What made you decide to do this film? I’ve been intrigued by the questions at the heart of this film for quite a while. What it takes to become a champion. The psychological legacy we carry from our parents. I’m also quite obsessed with behavioral economics research and the growing body of work in the fields of mindset and happiness. I listen to way too many TED talks and read all of the popular behavioral economic authors like Dan Ariely, Martin Seligman, Malcom Gladwell, David Epstein, and Atul Gawande. When I learned of this interesting subculture in tennis, I felt like it was an uncharted body of water in which to troll for insights about all of my passions. I’d also been writing narrative screenplays for a while, and was looking for an opportunity to make a film. So with this project, all of my passions conveniently coalesced. A little bit. Tennis was not available to me growing up. There weren’t public parks programs in my small town, and private clubs were beyond our means. I started playing in my 20s. I’ve since learned that many of the most accomplished senior competitors started even later than I did! I’m hoping to play even more tennis now that the film is complete. Logistics. I filmed at tournaments in all four corners of the United States. Tournaments take place over 4-5 days, and you never know until the last minute if the players you are focusing on are going to win, get injured, or be unable to travel to the tournament for some reason. Finding a way to fund the travel, cover multiple matches on different courts, and then piece together the footage into a cohesive story was a challenge at every moment and on every level. Plus, as a first time director, I was learning along the way. Another major challenge was the fact that tennis is difficult to film. The court is wide, the action sequences short and the players’ actively work to control their emotions. There's lots of money in tennis so funding this project must have been easy, right? Funding this project was far from easy! Is finding funding ever easy? With the help of many lovely people, I did a Kickstarter campaign to fund the production budget. My greatest champion and source of significant grant support came much later in the process, when the visionary leader of Aegis Senior Living saw the appeal of this inspirational story to a broad audience. Are you insane? What makes you think people are interested in 80-year-old guys? Um, have you heard of Bernie Sanders? My wish with GOLD BALLS is that it helps us understand how much control we have over our success and happiness at any age. While the title GOLD BALLS seems to celebrate winners, I hope people will see what I see; that becoming a “Champion” is not about pursuing a goal with single-minded dedication. It's about engaging in purposeful activity, building connections, and sharing our talents and enthusiasm to create a truly satisfying and contributory life. This means that we have more control over our own success and satisfaction than we think. Also, that growing older doesn’t have to result in our world shrinking. That’s an amazingly hopeful and uplifting idea. Has anyone died during the making of GOLD BALLS? 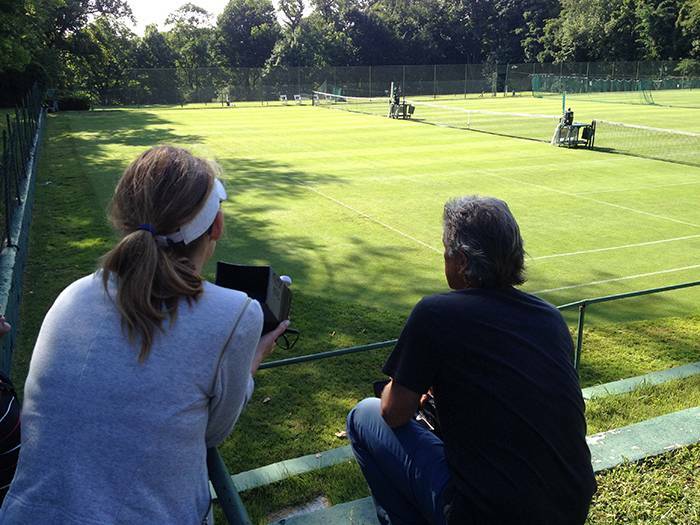 Fortunately, the risks involved in filming 80-year-old tennis matches are minimal. No crew or participants were harmed in the making of GOLD BALLS. But, seriously, I suppose that this question is understandable given the age of our subjects. None of the main characters departed for “Wimbledon in the sky” during the making of the film. (That’s how Bob Sherman refers to the afterlife). Alas, Vic Braden, the charming and generous “Pied Piper of Tennis” whom we interviewed in 2013 did pass away midway through the production. Dorothy “Dodo” Cheney , legendary Gold Ball record holder (she won an incomprehensible 394 Championships) also passed away a few months after we met her at the La Jolla Beach and Tennis Club. And finally, we were honored to have met and filmed the charming Aussie Neville Halligan in Laguna a few months before he passed away. I’m spending most of my time promoting GOLD BALLS, although I really need to work on my serve. I also have a few writing and producing projects in development. Scientific research supports that the best way to stay young is through exercise. 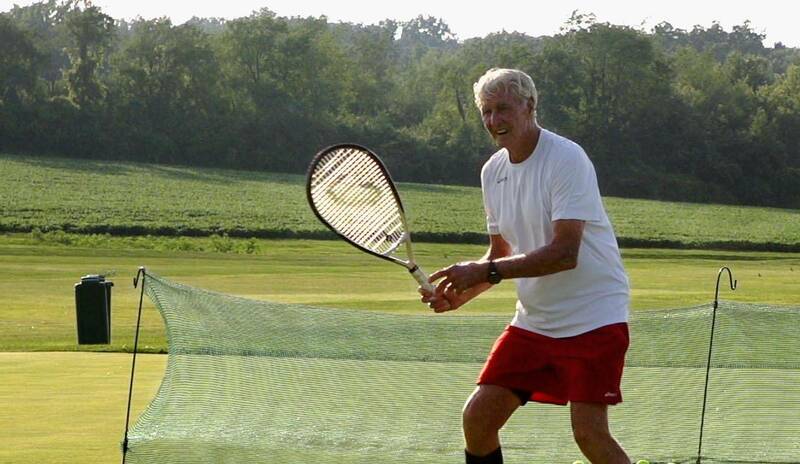 Research also supports that tennis is one of the most effective forms of exercise for adults. Boomers now represent the largest cohesive, affluent audience for film and television. Friend us and follow us to learn when and where screenings and other events will be held. Copyright © 2016 80-Love Movie, LLC .